Sophia is by far the most comprehensive source of not just validated leads, but key wisdom for smart decisions in the retail industry. It is the only lead generation system that links IT spend, to specific technology, to specific personnel, to specific financial results, tied together and backed by our advisory staff. Sophia provides insight into nearly 300 types of hardware/software/services and key personnel for over 7,000 retailers and restaurants in North America and Europe/Middle East/Africa. 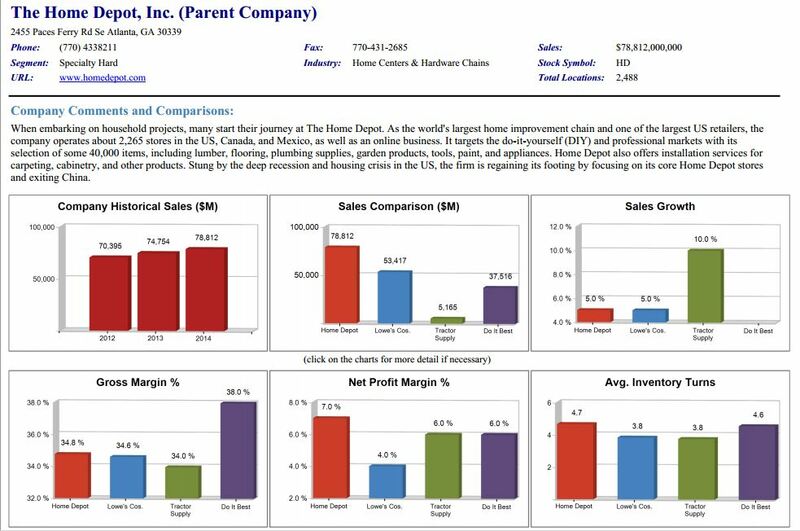 Now with Predictive Analytics, the system allows for benchmarking against competitors, identifying which retailers are leaders in specific technologies, their projected IT spending plans in key categories(like Business Intelligence/Analytics, Merchandising/Supply Chain, ERP, and Store Systems), and which technologies they are likely to purchase in the next 24 months. Sophia is the only data research that takes an enterprise view of the technology that retailers are deploying AND the performance that they are achieving with the use of these technologies. All wrapped up as an industry best lead generation system. It allows you to let your sales team focus on specific opportunities instead of wasting jet fuel and money going from prospect to prospect with no insight. Company Profiles – Complete profiles of companies on 300 different technologies they have deployed. Lead Generation – Over 100,000 validated contacts with emails based on technology installed and likely replacement dates. Graphical Financial Benchmarks – Compare key financial metrics of retailers by segment and subsegment. Zoom in to review the financial metrics for the entire retail segment. 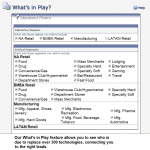 IT Spending Breakouts – Each SPA profile includes projected IT budget information for hardware, software, services in the following categories (Infrastructure, Store Systems, Core ERP, Application Development, Collaboration, Merchandising/Supply Chain, Commerce, BI/Analytics, Sales & Mktg, Legal/Real Estate). Key Technology Leadership – Is the retailer a leader in particular technologies? We look at key financial metrics and the strength of the retailer and leadership in key technologies in each company SPA profile. What’s in Play – One of the key benefits of Sophia is the ability to see into the future for each retailer and see which systems are due for replacement and which game changing technologies they are likely to invest in within the next 24 months. Key Vendor Influence – Every account has key vendors that have significant influence to enhance your opportunity or block your opportunity. The SPA profiles show you which vendors in the account are your friend or foe. Watch this brief video for a more complete introduction and then give us a call to setup a complete demo and free trial of the most complete knowledge service for the retail & hospitality IT industry. Crunching over 9.0 million data points Sophia currently tracks hundreds of software types (ie. Mobile, Video Analytics, Big Data, Beacons, and Mobile Payment and traditional technologies like POS, CRM, Ecommerce, Order Management Systems, Merchandising, Data Warehouse, etc. ), hardware platforms (ie. 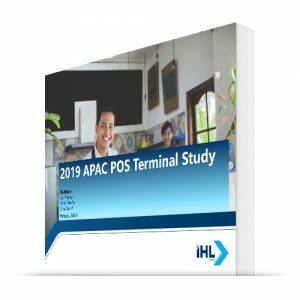 POS, Scanners, Servers, Printers, Self-Checkout, etc. ), types of services (ie. Maintenance, Help Desk, Custom Programming, etc.) and key personnel (ie. CIO, IT, Store Operations, etc.). What’s in Play? – anyone can give you a list of retail accounts, but what is most important is to find out which are most likely to buy your technologies. In other words, what accounts and technologies are in play and likely to be replaced soon. Sophia is the only data service to provide this data on nearly 300 retail technologies like Mobile, Business Intelligence, Analytics. 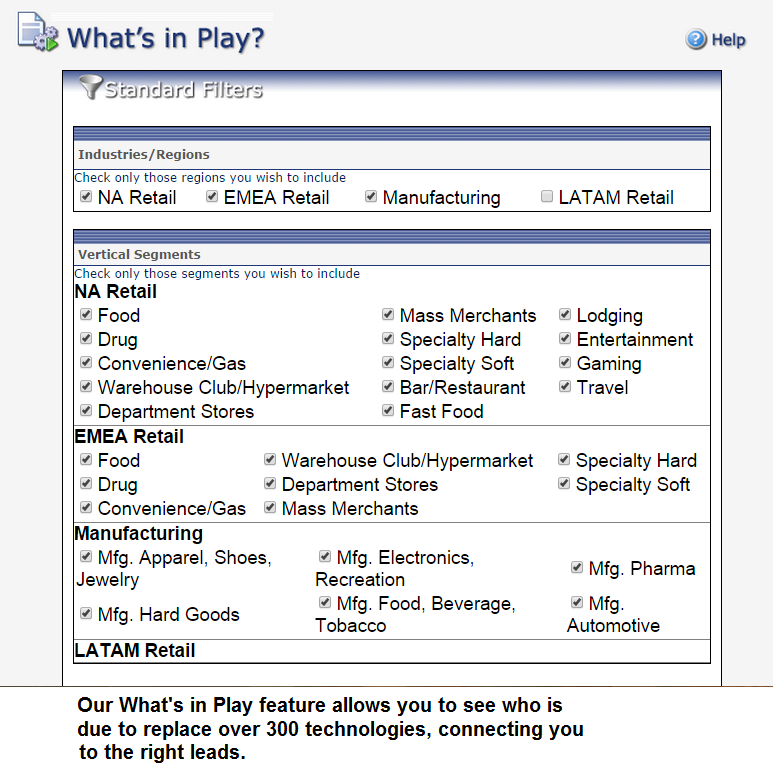 Company Technology Profiles – Use filters to generate retailer technology profiles from our list of thousands of retailers and restuarants. 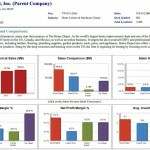 Each profile includes revenues, IT spend, competitive comparisons, hardware, software, services, and key personnel. 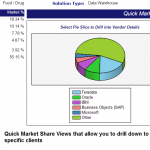 Vendor Profiles – Choose from hundreds of profiles on technology vendors. Each profile includes key contacts, customer references, platforms and segments supported as well as individual solution overviews. 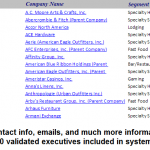 Vendor Scorecards – Run reports such as “Who offers business intelligence software?” and get a comprehensive list of vendors and the segments in which the solution is offered. Click through to any vendor profile and their customers and full solution portfolio. 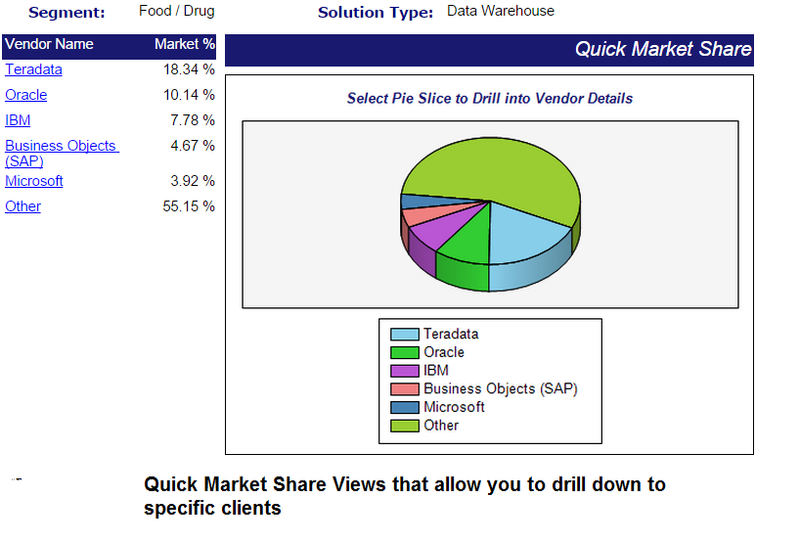 Quick Market Share – Find vendor market share for specific retail technologies (ie. 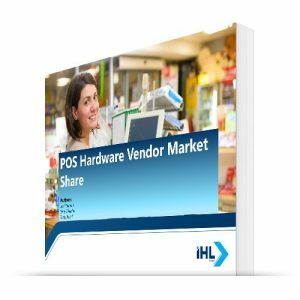 POS Software vendor market share for Food/Drug Retailers)based on the data in the system. Enterprise Access – unlike other research firms that charge on a per seat basis, your subscription to Sophia comes with enterprise access to the data. IT Spend – with this edition we have added estimated IT spend for hardware, software, services and labor/overhead for each retailer based on industry survey results. This includes both capitalized and expensed IT spend to help vendors and retailers better align their spending to industry leaders. Output to Excel, HTML, PDF or XML formats – easily get output to Microsoft Word or Excel so that you can manipulate the data and use it in your every data activities. What vendors seem to have a strong account presence in this account or segment? To view product screens and download a Free sample click the Preview tab. How is your Sophia different from other services in the market? 1) First and foremost it is the training of the people that we have involved with Sophia. Combined we have over 75 years of retail technology experience developing technology and consulting retailers and technology companies in retail. We have thousands of contacts in the industry and know where to get the answers when we have questions. 3) Each of the names and emails are validated monthly so your bounce rate is considerably lower than others. 3) Sophia is the only industry tool that matches IT spend of retailers to their financial performance. 4) It is designed for the Business User. Most other systems are designed for db administrators. You simply get a huge book or a bunch of tables. We provide a business user front end that greatly enhances the usefulness of the system by the people who need the data most. You can be up and productive in less than 5 minutes. 5) While others may track 10 types of hardware and software, Sophia provides insight into nearly 300 technologiesThere is a depth of technology information that is unmatched in the industry. How often is the systems updated? We are working to update Sophia every day, but the database is updated corporately once every three months. Every month we update between 15,000 and 20,000 data points to keep the data as fresh as possible. 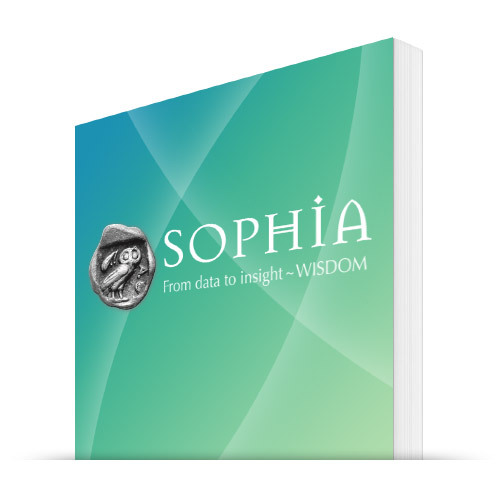 Whenever you get to know Sophia, you can be assured that the information you get is as fresh as the last 14 -21 days. Where do you get all this data? Anyway we possibly can. 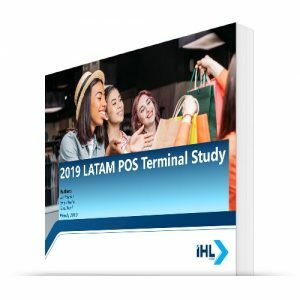 We leverage surveys, personal relationships, hundreds of store audits, trade show presentations, trade magazines, case studies, customer lists, press contacts, press releases, news stories, etc. Every day our team sees close to 5,000 news stories and much of the data is simply low hanging fruit from secondary information that is out there. How can I tell that the contacts/personnel are not old? We clean the data every month. Each personnel entry has a date changed field or the date in which we verified that this person is still with the organization. If that date has not been updated within the last two years and we are unable to verify that person is still employed with that company, we delete them. One time we deleted 30,000 names – that was a challenge to finally push that delete button but we are more interested in the quality of the information than the quantity. Can I just see Sophia at work first? Absolutely, we would be happy to schedule a webinar for you and your company. For more information contact us at +1.615.591.2955. What are the requirements to start using Sophia? All you need is a web browser and an advisory relationship. Each user from your company must register using the company email domain but will have full access to all the data services and research studies for which your company has subscriptions. Still have more questions, contact us at 888-445-6777 xt1 or +1.615-591-2955 if calling from an international location. To download a Free Sample, see the Preview Tab. This add-on allows for the users to get thousands of vendor profiles with key personnel, solutions offered, segments in which they offer their solutions and the platforms supported. Purchased together with the Sophia segments this offers drill-down ability to data on customers and those customer profiles.